Philips TV app lets you 'try' before you buy | What Hi-Fi? Philips has released an augmented reality Apple/Android app that lets shoppers see how each Philips TV model will look in their home. The TV Buying Guide app also gives recommendations for the best TV to fit the needs of the user, their budget and their room. To use the app, just download it from the Apple App Store or Android Market, print out the Augmented Reality marker (you can email it to yourself from your phone) and place it in the spot in the room where your TV will be placed. 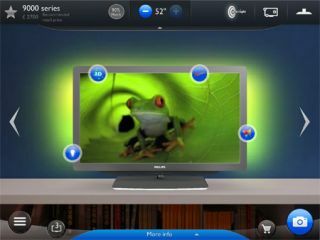 Then fire up the app on your smartphone or tablet, point it at the marker, and using the video camera a virtual 3D model of the TV will appear in the chosen space on your tablet/smartphone screen. You can view the TV placed on a stand or on the wall. The app also allows you to choose a TV based on your budget, screen size, design and picture quality. And you can click on hotspots to learn more about the key features of that particular model, as well as see the sets either with a blank screen or content running on the display. Features such as Ambilight can be turned on or off. The free Philips TV Buying Guide app is now available in the UK, Germany, France and Brazil, and will eventually be available in 30 different countries and 18 languages.